Your title is “Production Director” but we also know you as a staff photographer and creative brainstormer. Are there some other roles missing from that title? The other role would be Graphic Designer. Tom: The first 8 of my 18 years in print were spent as a graphic designer. I really enjoyed it, but I became more interested with the printing process when I was asked to start doing quarterly press checks. Eventually, I fell in love with the smell of printing inks (haha) and migrated to the Production team. After spending many late hours press side, I have great respect for the symmetry between design and production. Understanding both operationsenables you to be a translator for both teams and helps avoid potential issues on press which saves hours of time for all involved. On the production side of things, what advice do you have for clients looking for production efficiencies in direct mail? Or, are there any trends we should be thinking about? Tom: In a business that has evolved tremendously over the past 30 years and continues to do so, I believe it’s important to learn and adapt to new print and technological capabilities. We’re always looking for ways in which print can support digital media and its good know that the USPS has offered cost savings through promotions which integrate print and mobile interaction. When budgets allow, direct mail pieces with elements such as interesting folds within letter rates, textures, and augmented reality can showcase creativity while still maximizing postal discounts and ROI. After hours, you often find yourself behind the drums. Tell us a little about the Zen of drumming and gigging with a band. Hint, this would be a good place to plug some upcoming shows. Tom: Playing drums has been a passion of mine since I was 12 and a place to escape the noise of the world to make my own. It always allows me to come back to my own rhythm very much like meditation. 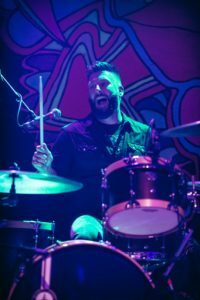 When I started playing in bands in my 20’s, I learned about the connection between musicians on stage and in the studio. It’s really about working as a team, without overstepping another instrument, to allow the best song to come forward and deliver impact. Working in the creative space of design and print has been a similar experience. DCI’s work can be seen at www.directchoiceinc.com and upcoming shows for The Parsnip Revolt can be found here at www.theparsniprevolt.net/shows. Please check out both! Finally, how long have you been at DCI and in the industry? What’s the craziest/most challenging thing you ever had to produce? Tom: I’ve been with DCI for 2.5 years and in the industry for over 18 years. The most challenging aspects of my career to this point have not been about one or two particular jobs. It’s been about clear communication, time management, and commitment to quality. It sounds basic but there is a great amount of hard work and collaboration that happens behind the scenes with vendors and client teams, in a condensed amount of time. To briefly exemplify this, my current record for how many states I traveled to in 24hr period for one publication is 5 with 4 press checks built into it. Yes, it sounds crazy. However, I thrive on fast-paced work while establishing lasting bonds through good teamwork. It’s the most rewarding part of my job.